All MECS journals are fully peer-reviewed by independent academic editors and reviewers. We only publish articles that have been approved by highly qualified researchers with expertise in a field appropriate for the article. Every journal that we publish has an Editorial Board of academics from institutions around the globe. The Editorial Board is linked from each journal’s landing page. After you submit, a member of the board will be appointed as Handling Editor for your manuscript. This selection is based on the Editors’ availability and suitability, taking into account potential conflicts of interest. Upon receiving a manuscript, the Editor has the option to reject it outright. This may happen if it is not a good fit for the journal or of insufficient quality. 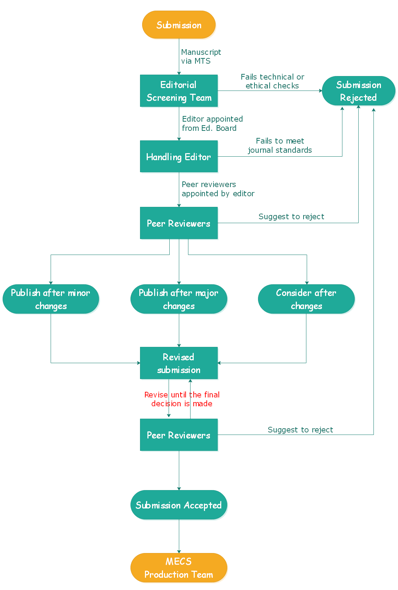 Providing the Editor is satisfied, they will initiate the peer review process. The Editor then appoints a number of external reviewers. MECS has developed software that helps them to identify suitable reviewers, but editors are also free to nominate reviewers from contacts within their field. MECS journals follow a single-blind review process, and the identities of the reviewers are not disclosed to the author(s). Using the submitted reviews, the Editor is then able to make a final recommendation on the manuscript. A manuscript must be rejected if the majority of the reviewers recommend doing so. · Publish Unaltered: The manuscript will receive a further check from MECS’s Editorial Team for consistency. Once complete, the author will be notified of the acceptance of their manuscript. · Consider after Minor Changes: The author will receive feedback and be asked to submit an amended version addressing the reviewers’ concerns. The Editor will check the amended manuscript and ensure the concerns have been addressed. If satisfied, the Editor can accept the manuscript. · Consider after Major Changes: The author will receive feedback and be asked to submit an amended version addressing the reviewers’ concerns. The amended manuscript will be sent to the original reviewers to be reassessed. The Editor will then make a recommendation and may ask for further amendments. · Reject: The manuscript is immediately rejected.